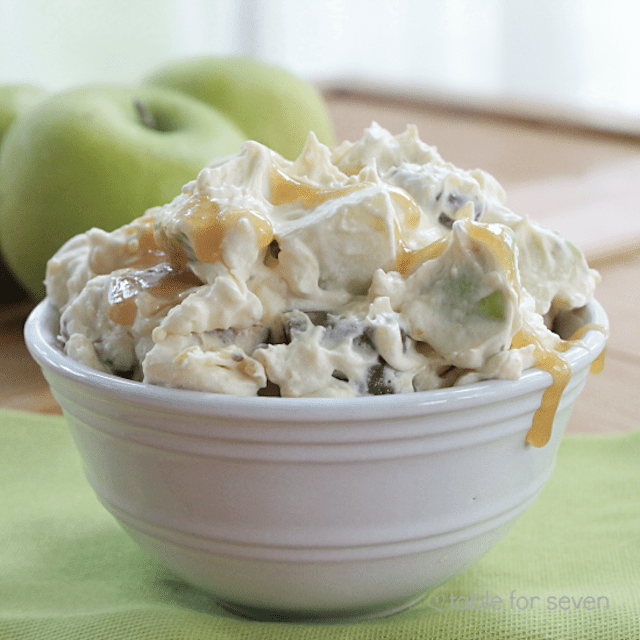 This taffy apple salad makes a light and refreshing dessert that's perfect for potlucks and parties. Although the recipe calls for the salad to be chilled 8 hours, you can serve it right away if you're short on time. And be prepared--once you make this dish, people will want you to make it again and again! Drain the liquid from pineapple chunks into a 3-quart saucepan. Add the vinegar, sugar, egg, and flour. Cook over medium heat, stirring constantly, until thick. Remove from the heat and pour into a large bowl. Add the thawed whipped topping, stirring well to combine. Add the pineapple chunks, apples, marshmallows and peanuts. Stir well. Refrigerate for about 8 hours before serving if possible, although it's fine to serve it right away if you're short on time.